US Customs and Border Protection (CBP) has seized nearly 10,000 counterfeit products, valued at more than $1.6m, in San Juan. The haul was intercepted at the Luis Munoz Marin International Airport and included a wide range of counterfeited products, including medical equipment, automotive parts, luxury jewelry, electronics and more. 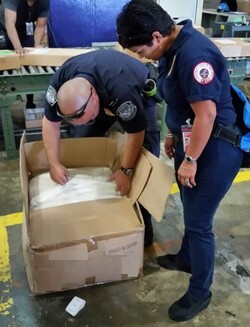 Various shipments inspected by CBP officers during the operation revealed products that infringed the intellectual property rights of numerous branded names, as Apple, Audi, Beats by Dr Dre, BMW, Cartier, Gucci, Mercedes, Oakley, Pandora, Porsche, Samsung, Tous, Toyota, among many others. The products were all shipped from vendors in China. The seizures were all part of a week-long operation carried out by CBP's Mobile Intellectual Property Enforcement Team (MIPET), with the support of the Food and Drug Administration (FDA), Homeland Security Investigations (HSI), and the National Highway Traffic Safety Administration (NHTSA). "Trade intelligence, joint targeting and combining inspectional resources from our partner agencies are all key ingredients to protecting the US economy and consumers from counterfeit products," said Edward Ryan, assistant director of trade for Puerto Rico and the US Virgin Islands. "We are looking forward to conducting follow-up MIPET operations with our partners to further protect legitimate businesses and consumers from intellectual property thieves."